Latoya Bridgewater was pregnant with her second child when her first child was three years old. Being the concern mother that she is, she was worried about her attention being divided once the new born were to arrive. Hence, she looked for other ways to make sure that the time spent together with her eldest child would make it more special for him. “I found that I was drawn to a book called ‘A Child’s Garden of Yoga’, so I bought it and began doing yoga with him,” stated Latoya. She mentioned that both her son as well as herself enjoyed the practice. 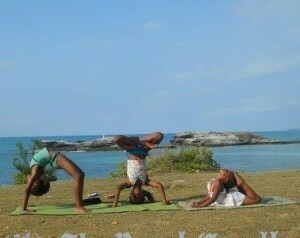 Now, she has a total of three children and is a certified yoga instructor. In fact, she still continues to practice with all her children. “The girls grew up seeing me do yoga so it has been very natural for them,” she explained. 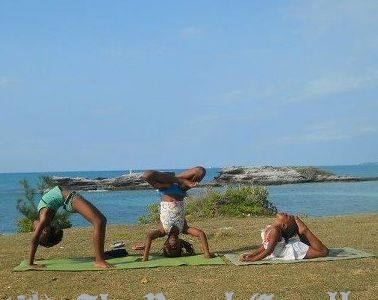 When some of her friends noticed photos of her children in various yoga poses, they were rather intrigued by it, so they asked her if it was possible for their own children to join in the practice. From then on, she received more referrals along the way. Soon, the class became so popular among the kids that she had to include a special yoga class just for children to her offerings. “I don’t do the same thing I do with adults because naturally their focus is different,” she said. She has a strong belief that play and enjoyment goes hand-in-hand in a child’s optimal development. Regardless, she didn’t want children to be forced to attend her classes. “I don’t think children should be made to do anything that they don’t enjoy unless it’s life-threatening. I want them to express what is inside of them and if a child is uncomfortable with that, they should not be forced to do it. Yoga is good if you understand and appreciate it. If children can enjoy it and have fun they will want to do it. For young children the centre of their lives is about learning and having fun it’s not all in the playground. School should be fun too,” she explained. Aside from the fun element in yoga, she went on to talk about the physical, mental and emotional benefits it has for them. “Children experience stress just as adults do. It’s just that they express it differently. So yoga practice brings stress release for children. Although we do a lot of play, yoga requires some focus. You develop your ability to focus when you get into a pose. You have to focus in order to do it. And children also learn to challenge themselves. They persevere at attempting a pose until they achieve it. When my son started and we did tree pose, he fell a few times but he really wanted to be able to stand in the pose and he focused and persevered until he did,” she said. For the full story, you can read it here. Looking for yoga classes in Singapore? Do check out OMG Yoga to see what we have to offer. For those who are keen in signing your children up for yoga classes, do drop us an email and we will get back to you on it.